One Cartridge, not a Box: 500-465 N.E. 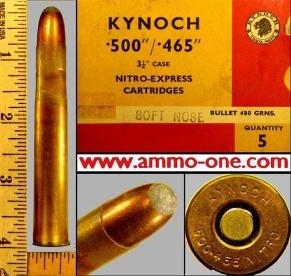 by Kynoch of England, factory loaded with (then) new Kynoch brass cases with older “KYNOCH 500-465 NITRO” Head-Stamp, 3 projectile crimps on case, large copper primer and 480 grain Copper, JSP (Jacketed Soft Point) Projectile, very minor nicks due to factory process at the time and very minor spots. Nice Patina.